Nike recently asked a bunch of riders including Superted and Kyle from DQM to choose colourways for a Nike Air Zoom Tiempo Cycling Sneaker. All the profits from the shoe will go to the Livestrong Foundation. Kyle and Hassan flew into London on Tuesday and today set off with Ted, Andy, Grace and others to ride to Paris for the finish of the Tour de France. They’re gonna take a couple of days to get there and are planning on camping en route then partying in Paris when they arrive. 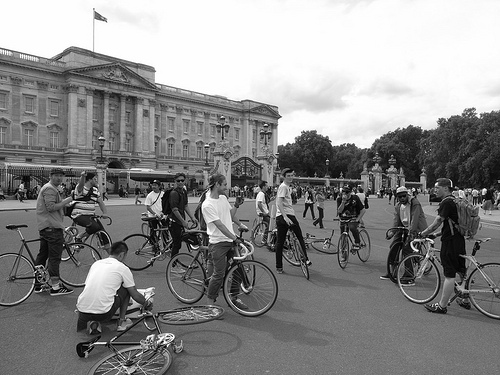 Check the Fixed Gear London blog for updates! Grace will be filming all the action. Oh my god, really want to join! the end of le tour! yeah me too! I wish I had gone but instead I am sat at a desk working. Well actually, not working at this very minute as I am writing this but I am meant to be……….